One hundred years after U.S. involvement in World War I, it is time to revisit our literature that came out of that conflict–because we are only now, finally, able to understand it in its actual historical context. That is the purpose of my new book, War Isn’t the Only Hell: A New Reading of World War I American Literature. It draws on military archives and cutting-edge research by social-military historians to fully and properly come to terms with the works of thirteen of our major writers, including some of our most famous authors and some who were in their own time well-known but have been mostly forgotten. To raise and organize a huge army and officer corps almost from scratch, as I show in War Isn’t the Only Hell, the army conducted America’s first, large-scale national experiment with meritocracy, mostly assigning men to positions and ranks based, not on class, family, and ethnicity, as had been the practice in the Civil War, but on merit. Though the army was notoriously discriminatory against African Americans, it nonetheless made a groundbreaking attempt to extend egalitarian treatment to all other ethnic groups, as well as to the poor and working class. This policy was not a matter of social justice but of the practical, bottom-line aim of winning the war. Indeed, the army’s original plan was for no discrimination against African Americans as well, but the military brass was overruled by a federal government pressured by alarmed white southern leaders. And meanwhile–despite, on the one hand, the vicious army discrimination instead instituted, and, on the other, continuing protests by white southern officials concerning black participation–inclusion of African Americans in the war effort involved some black troops in battle, saw a limited number of black officers, and gave hundreds of thousand of black men a chance to experience a country (France) that was not governed by racial discrimination and Jim Crow laws and that came to embrace them. Because we have forgotten this aspect of the American war experience, we have failed to properly understand our World War I literature. 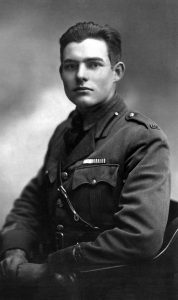 The well-known American World War I Lost Generation writings of Hemingway, Fitzgerald, Faulkner, Dos Passos, and Cummings have long been interpreted as an alienated and disillusioned outcry against modern warfare, brutal military discipline, and government propaganda. In fact, as I demonstrate, their works were largely motivated, not by the experience of the horrors of war, but the failure to have those experiences–because, despite their privileged backgrounds, and because of the new meritocratic policies, they all ended up as noncombatants at a moment when the culture granted masculinity only to combatants. Their books spoke for the noncombatant majority of doughboys who experienced a different alienation and disillusionment: that of shame. In the book, I argue that American World War I literature was a response not only to the shock of war but to the culture shock of meritocracy. The supposedly antiwar texts of noncombatant Lost Generation authors addressed–often in coded ways because it was embarrassing–the noncombatant failure to measure up. Our best literature by combat-soldiers, writers William March, Thomas Boyd, Laurence Stallings, Hervey Allen, and Victor Daly, have also been considered by literary critics and historians to be straightforward antiwar narratives. But these books, while depicting the hell of war, are also profoundly shaped by experiences of meritocratic or French recognition, especially meaningful for socially disadvantaged men. The sole World War I novel by an African American veteran, Daly, reveals a complex experience of both army discrimination and empowerment among the French. Likewise, some of our most famous World War I women writers–Katherine Anne Porter, Willa Cather, and Ellen La Motte–were reacting not only to the shock of modern war, but to new employment and social opportunities for women at the front and stateside, including their new power, at home, as arbiters of masculinity, a power that temporarily altered gender relations. 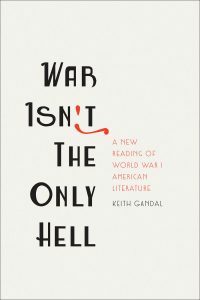 Ultimately, my new book, War Isn’t the Only Hell, shows how American World War I literature registers the profound ways in which new military practices and a foreign war unsettled traditional American hierarchies of class, ethnicity, gender, and even race. Keith Gandal is a professor of English at City College of New York. He is the author of The Gun and the Pen: Hemingway, Fitzgerald, Faulkner, and the Fiction of Mobilization. He is also the author of War Isn't the Only Hell: A New Reading of World War I American Literature. Contact the author.